AngularJS forms and controls can validate input data. 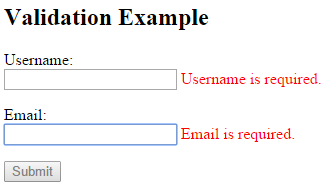 AngularJS forms and controls can provide validation services, and notify users of invalid input. Tips: Client-side validation cannot alone secure user input. 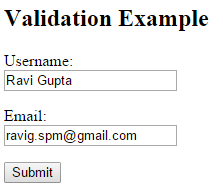 Server side validation is also necessary. The HTML form attribute novalidate is used to disable default browser validation. The AngularJS directive ng-model binds the input elements to the model. The model object has two properties: user and email. Because of ng-show, the spans with color:red are displayed only when user or email is $dirty and $invalid. The user has interacted with the field. The field content is valid. The field content is invalid. User has not interacted with the field yet. 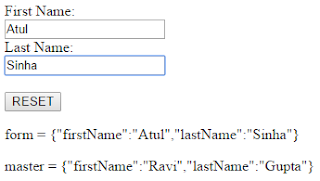 An AngularJS form is a collection of input controls. HTML forms group HTML controls together. The novalidate attribute is new in HTML5. It disables any default browser validation. The ng-app directive defines the AngularJS application. The ng-controller directive defines the application controller. The ng-model directive binds two input elements to the user object in the model. The formCtrl function sets initial values to the master object, and defines the reset() method. The reset() method sets the user object equal to the master object. The ng-click directive invokes the reset() method, only if the button is clicked. The novalidate attribute is not needed for this application, but normally you will use it in AngularJS forms, to override standard HTML5 validation.